Imagine standing up in front of a room full of people and openly discussing feelings of vulnerability, fear, anger and pain. 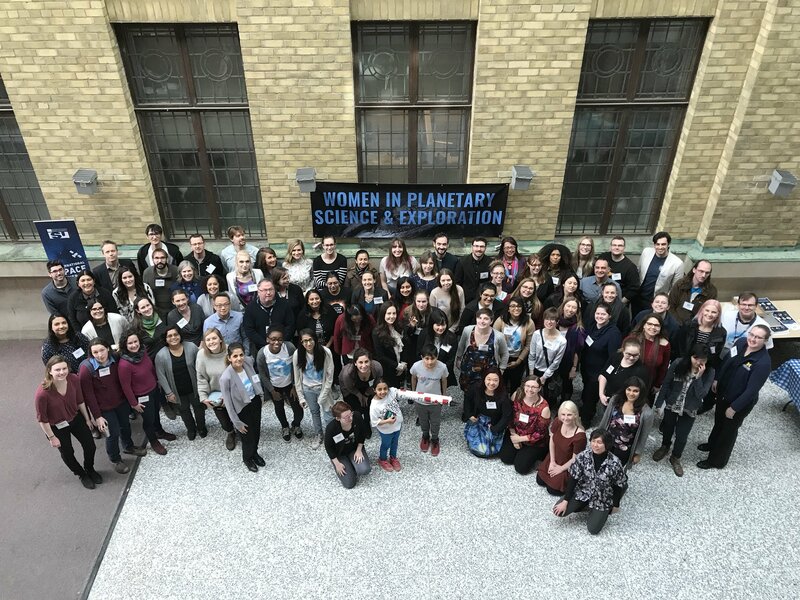 In my view, that’s an incredible act of bravery - and I was honoured to hear some of those brave personal accounts from the participants at the Women in Planetary Science and Exploration Conference (WPSE2018), which took place Feb 17-18, 2018 in Toronto, Canada. When it comes to the fields of Science, Technology, Engineering, and Math (STEM), women, people of colour, the LGBTQ+ community, and all the intersections of marginalised groups are underrepresented at best and overtly harassed at worst. While conversations surrounding the lived experiences of these people may have been happening for decades, they have been behind closed doors, in emails, or otherwise in confidence with a trusted friend. Fortunately, we are seeing an example being set in popular culture today of these topics being discussed. While uncomfortable, these themes need to be addressed head-on. A typical academic conference focuses its schedule on research talks. These are brief talks, usually 15 minutes, given primarily by graduate students discussing their active research. In the case of WPSE2018, topics of research included meteorites, terrestrial planets, exoplanets, the Moon, and the outer solar system. It is one of the best ways to actively participate in the scientific process, and is of particular importance for young scientists establishing themselves in their field. In most academic conferences, there may also be a session dedicated to education and public outreach, or possibly academic funding, or maybe large projects coming up that involve many organizations. But conversations that directly discuss issues being faced by people in the fields are never part of the main narrative. The WPSE2018 conference balanced academic research in the fields of planetary science with the complex issues that face the people who actually do the work. In addition to the typical research talk sessions, there were multiple panel discussions that focussed on lived experiences. For example, there were panel discussions on LGBTQ+ Issues in STEM, Women of Colour in STEM, and Harassment in STEM. These conversations were not at lunch sessions, after-hours conference social events, or any other side event or forum. The panels were front-and-centre in the schedule, and thus expected your participation. In the panel discussions, we heard directly from the people who are experiencing workplace discrimination and harassment, and how they have been dealing with their experiences. In structuring the conference this way, the organizers and participants challenged the idea that work is separate from lived experience. The conference forces me to look back on my own experience in grad school. I entered a masters program in astrophysics at the age of 21 when I left my undergrad and I stuck with it through a PhD program. I worked long days, I dealt with living at the poverty line (being a grad student isn’t particularly lucrative), I dealt with constructive criticism of my work and the imposter syndrome, I worried over where my career was going, and the challenges that come with interpersonal relationships. And I did all of that as a cis white male. How much harder must it be to deal with those challenges, but also with systemic devaluing of my work, openly derogatory comments about my gender, or active exclusion based on my appearance (whether social or work related)? How incredible is it to still succeed in the face of that kind of adversity? In my position of privilege, I haven’t been forced to live through those experiences. As a passionate science communicator, Jesse Rogerson loves promoting science literacy to the public. He frequently represents the Canada Aviation and Space Museum on television and radio, social media, and at conferences. He co-developed a science communication workshop for Canadian science professionals, to instruct them in more effective methods of communicating their science. A trained and practicing astrophysicist, Jesse holds a PhD in observational astrophysics from York University, and recently published a peer-reviewed paper in The Astrophysical Journal. Jesse enjoys riding his motorcycle, board games, and ultimate frisbee. Are We Losing the Night Sky?